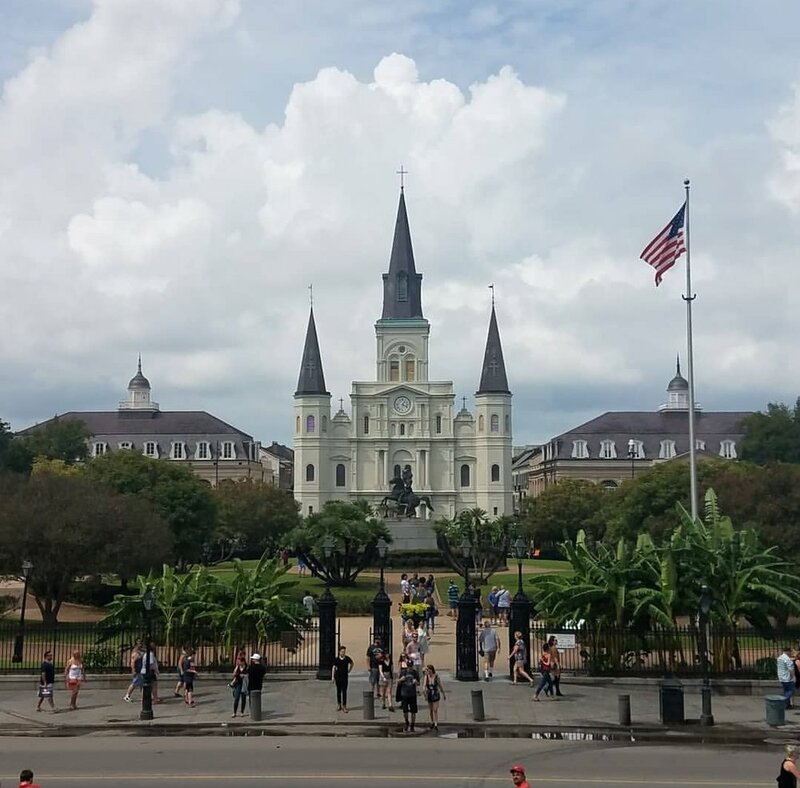 This past September I was lucky to be able to share the experience of traveling down to New Orleans with my mom for a Being Boss seminar. Being Boss, for those who don’t know, is a podcast my mom listens to on the regular where two women (Emily Thompson and Kathleen Shannon) talk about the trials and tribulations they faced as women creating their own businesses and becoming their own freelance agents. The podcast tends to draw in creative types, people who have a hunger to serve their community and the ability to change and adapt to how it needs to be done in order to set themselves apart from others. Because our aim with B⭐UR⭐SLF is to be able to serve our community through new products and providing information the people we would be surrounding ourselves with through this seminar seemed like the best to help us learn how we might be able to go about doing that. For the past few years Emily and Kathleen have been hosting these seminars around the US so that they can share their stories and provide hands on workshops to help people better understand the nuts and bolts of building a business from the ground up. Our itinerary was packed for Thursday and Friday with a mix of business classes and some more vacation style activities as well. The night before it all kicked off the bosses met up for a mixer hosted out of Brennan’s. It was a nice casual evening that allowed us to better get to know some of the women we’d be spending the next few days with before we got in to the full swing of things. It was a nice way to start off our work vacation, by meeting new friends and being able to see all the beautiful decor and historic artifacts that Brennan’s had encased around their upstairs area. The official day one came in the form of brunch, our first masterclass, a pop up shop, and a ghost tour. We met downstairs on Thursday at 11am to start our day by filling up on a nice breakfast buffet. The first hour was spent sitting around and getting to know other people that we didn’t have the chance to meet the night before as we ate. After that we had our first masterclass presented by Podia, who taught us about how we can create online courses and how to make them better. They focused a lot on making it known that even if you didn’t consider yourself an expert in something, chances are that someone else would. This was followed by a pop up shop where some of the bosses took the time to show off the talents they could bring to the table. We sold our first piece of merchandise ever that day. Between that and the last activity of the day there were a few hours of downtime where we separated from the group to seek out dinner for the evening. We ended up at a dive bar that served surprisingly good fettuccine alfredo and had a nice conversation with our waiter who, after seeing our cat themed phone cases, was more than happy to talk about his own cat who would be coming home from the vet that evening. To top the day off, being boss sponsored a walking tour of the french quarter that discussed the history of the ghosts and vampires they claimed to have call it home over the years. The next day started a bit later, leaving us time to venture out for breakfast on our own. Our walk led us down near the Saint Louis cathedral and the French market where we ended up finding a nice corner place that only judged my mom a bit for ordering scrambled eggs and fried oysters together. We gathered back in the hotel a few hours later to have a short town hall before starting our next masterclass. This one was presented by freshbooks and focused on how we could become more confident when it came to dealing with our businesses money. Surprisingly, even with my huge disdain for most things math related, I enjoyed this class more of the two we had. I like the idea of being able to organize things on my own time, and I love the idea of being able to learn new skills that would help us in business. Following that masterclass Emily and Kathleen held a live recording of their podcast (their 200th episode in fact) where they opened up the floor and allowed people form the seminar to discuss where they had come with their business and how they solved some of the problems they faced along the way. The whole thing ended later that night with a masquerade themed around woodlands. My mom and I dressed up as bobcat and a steller’s jay respectively, and we spent the last of our hours getting tarot readings, drinking cocktails, and enjoying conversation with those we had surrounded ourselves with the last couple of days. The program didn’t offer just technical support as far as building a business went though. It had a surprising amount to offer in the way of emotional support too. When I originally tuned my ear into a Being Boss episode, it was when my insisted we listen to #48 together. In that episode a trans man named Jay Pryor is interviewed. He discusses how he felt his relationship in business changed when he made his full transition and people started seeing him for the man he felt he was. When my mom found out about the seminar that would be happening in New Orleans this year, she knew they’d be welcoming of both of us (though she still sent a message ahead of time to ask, and I think you might be able to guess they’re stance on it seeing as I’m writing this in the first place). But it was more than just that. Just about everyone we spoke with about our product said they knew someone who could use it and that they were looking forward to being able to tell them about us when the time came. On my last night there I went out with a woman named Shaun who paid for the cover of my first gay bar and asked to hear more about where I hoped to go in life. There was a sense of community that had been naturally sought out, and I’m thankful to have been there to experience it. Before our plane flew out on our last day we took time to ourselves to do the touristy things we had been wanting to do. In the morning we took a 15 minute walk over to a small cafe for breakfast where I successfully befriended a strangers dog. After packing up we went to the museum of death upon my insistence (although I paid for my mom’s ticket so hopefully that made up for it). And after that we took a second walking tour through the French quarter to learn more about its history that also took us through Saint Louis Cemetery no. 1 where Madam Marie Laveau rests. That wrapped up our day and we headed back to the airport and took our two flights home where we scooped up our cats for overdue hugs and collapsed into our beds so we could sleep in the next day. The magic of New Orleans mixed with a group of people who knew a little bit about what it’s like to be starting from ground level and what it takes to drag yourself up is an irreplaceable feeling. We were constantly surrounded by people who were going through or had gone through the same things we were experiencing in creating a business. People were genuinely interested in what we had to offer the world and where we would be going with it. When you’re starting a business, it can be easy to get overwhelmed by all the things you have to do to even scratch the surface of your checklist, but when you hear from other people who have managed to do so there’s nothing more reassuring. I’m thankful for the time we spent in New Orleans, and for all the people we got to meet through Being Boss. I look forward to hopefully meeting some of them again somewhere down the line, and being able to show the progress we will have all made since the last time we crossed each other’s paths.